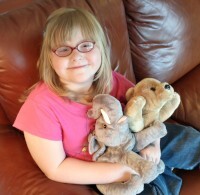 Wildlife STORYTELLERS, three soft plush animals offered by Christian Record Services, Inc., share music and Bible stories with children ages three through nine. The STORYTELLERS players are designed to introduce young children who are blind to reading services provided by Christian Record and to help them be ready to enjoy National Camps for Blind Children upon reaching age nine. Your gift today defrays the production expense of the audio programs and cost of these cuddly critters. Thank you for bringing joy to the youngest of Christian Record's clients! For Christian Record clients ages 3-9, this resource will now be available through your child's Liberty account. To access your account, click here. If you are legally blind and would like to register for free services through Christian Record, click here. Registration requires a doctor's note that verifies the level of legal blindness. For more information about this resource, please call Christian Record at (402) 488-0981.